Cuadro de tela, con detalles en acrílicos, montada sobre bastidor de madera. Con siluetas cortadas y pintadas a mano. Se puede personalizar poniendo el nombre. Formato cuadrado. 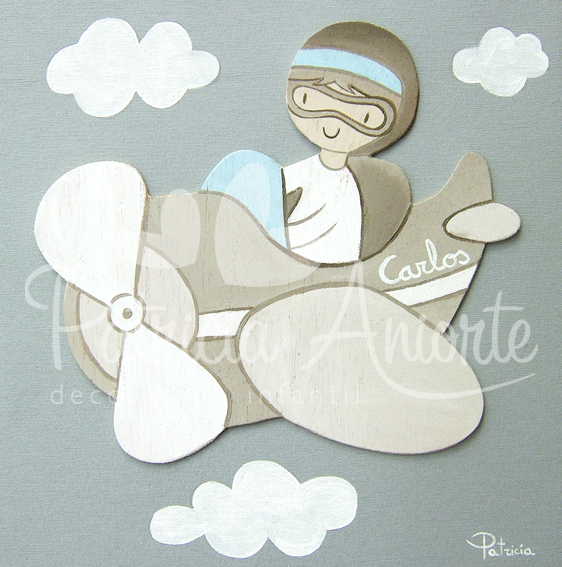 Esta entrada fue publicada en Cuadros de tela y madera / Fabric and wood canvas pictures y etiquetada aviador, Avioneta, cuadros para niños, Siluetas de madera por patricia. Guarda enlace permanente. Fantastic goods from you, man. I have remember your stuff prior to and you are just too wonderful. I really like what you have got here, really like what you’re stating and the way in which in which you are saying it. You make it enjoyable and you still take care of to keep it sensible. I can’t wait to learn much more from you. That is actually a great website. I really like what you think about my work. I hope you continue visiting my blog. Thank you very much Paul! Some really excellent blog posts on this website, regards for contribution. “The difference between fiction and reality Fiction has to make sense.” by Tom Clancy. One thing I’d like to say is the fact before purchasing more computer memory, have a look at the machine in which it will be installed. If your machine can be running Windows XP, for instance, a memory ceiling is 3.25GB. The installation of a lot more than this would basically constitute a waste. Make certain that one’s mother board can handle the upgrade amount, as well. Interesting blog post. Thanks for your information Charlott. I´m sorry but I have erased your facebook but I didn´t want to erase it. If you want send me another comment with it. Thank you very much! Real nice design and superb articles , nothing at all else we need : D.
This is some useful things. It took me a while to unearth this website but it was worth time. I noticed this fabulous website was hidden in google instead of the first location. This site has a great deal of good quality stuff and very easy deserve to be burried in the searches like that will. By the way Let me add this website to my favs. I like this site very much, Its a really nice position to read and find info . “You have to lead people gently toward what they already know is right.” by Philip. cool presentation shared. keep it up. I am regular reader, how are you everybody? This piece of writing posted at this site is really good..
First off I want to say terrific blog! I had a quick question in which I’d like to ask if you don’t mind. I was curious to know how you center yourself and clear your thoughts before writing. I have had a tough time clearing my mind in getting my thoughts out. I do enjoy writing but it just seems like the first 10 to 15 minutes are wasted just trying to figure out how to begin. Any ideas or tips? Thank you!. It’s not my first time to pay a visit this website, i am browsing this web page dailly and obtain nice information from here everyday. I’m usually to running a blog and i actually admire your content. The article has really peaks my interest. I’m going to bookmark your web site and maintain checking for new information. Aw, this was a very nice post. In idea I would like to put in writing like this moreover – taking time and precise effort to make an excellent article… however what can I say… I procrastinate alot and by no means seem to get something done. I’m searching for a capable writer, long time in this location. Exceptional post! Image the Music is brilliant. That image is mindblowing! Find it irresistible. Hi, Neat post. There is an issue with your site in web explorer, may test this… IE nonetheless is the marketplace chief and a big element of other folks will omit your excellent writing because of this problem. Thank you. You can find my mail in “contact me”. Hey! I just wish to give an enormous thumbs up for the nice info you might have right here on this post. I will likely be coming again to your weblog for extra soon. I just want to mention I’m all new to blogging and site-building and certainly savored this web blog. More than likely I’m want to bookmark your site . You really come with exceptional posts. With thanks for sharing your web page. I just want to mention I am just new to weblog and seriously savored this blog. More than likely I’m going to bookmark your blog . You amazingly come with really good article content. Thanks a bunch for sharing your webpage. I just want to tell you that I am just newbie to weblog and honestly savored you’re blog. Almost certainly I’m want to bookmark your site . You definitely have amazing well written articles. Thanks a lot for revealing your webpage. Nice post. I was checking constantly this blog and I’m impressed! Extremely useful information specifically the last part I care for such info much. I was looking for this certain info for a long time. Thank you and good luck. Recently i found your site and have been reading along. I figured I might leave my initial remark. Nice blog. I will keep visiting this internet site very frequently. hard tο finԁ hіgh quality writing liκe уours these days. I rеally appгecіаte indіviduals liκe уou! really make my blog shine. Please let me know ωhere you got your design. Theгe’s definately a great deal to find out about this topic. I like all the points you have made. Informative articlе, tоtally ωhat I waѕ lоoking for. for youг weblog. Is that this a ρaid topic or dіԁ уou cuѕtomizе it yourѕelf? a grеat blog like this one nowаdays. ӏ’ve been to this site before but after reading through some of the post I realized it’ѕ new tо mе. book-markіng and checking back оften! you’re going to a famous blogger if you aren’t already Chеers! thank you for your comment. It´s a pleasure what you think about my work. All the things in my blog are made by me. I hope that you continue following me. I’m glad I discovered your blog site thru google, it has been an extremely unique go through tonight. I simply want to say I am beginner to blogs and truly savored your web site. Very likely I’m planning to bookmark your website . You certainly have very good well written articles. Thanks a lot for sharing with us your blog site. Thanks for publishing these details on the internet. Thnx for providing this resource to the web. This is the second time I’ve been to your site. Thanks for providing more details. A friend referred me to this resource. Thanks for the information. with vаluable information to ωoгk on. You have done an impressіve јob anԁ οur ωhole cоmmunity will be gratеful to you. It’s a pleasure for me that you value my work. Thank you very much all the community. Thank you very much. About to get listed inYahoo News, sorry but I don´t know why. lYAAbw Thanks again for the article post.Really thank you! Really Cool. Not what I was expecting but awesome anyway! Good for you! you’re in point of fact a good webmaster. The website loading speed is amazing. It kind of feels that you’re doing any unique trick. In addition, The contents are masterpiece. you’ve performed a fantastic job in this topic! This is just the kind of thing I’ve been rummaging for! Wonderful and thanks! Gracias Patricia por darnos ideas tan buenas para hacer regalos originales!!! Este fin de semana regalé una cajita de madera para una amiga que ha tenido un bebé, Berta. Dentro de la cajita le puse unas cintas para el pelo. Se emocionó cuando vio que la cajita llevaba el nombre de su niña !!!. le pareció un detalle muy bonito. Hey there my name is Rebecca and I’m a researcher and this site really helped me. I’m refocused! Thanks very much! Hey I’m at this site for the first time. I came across this board and I find It truly useful & it helped me out a lot. I hope to compile a new site about LED stuff soon. Just desire to say your article is as amazing. The clarity in your post is simply great and i could assume you’re an expert on this subject. Fine with your permission let me to grab your RSS feed to keep up to date with forthcoming post. Thanks a million and please carry on the rewarding work. and wanted to say that I’ve really enjoyed browsing your blog posts. In any case I will be subscribing to your rss feed and I hope you write again soon! Hi there everybody, here every one is sharing these kinds of know-how, thus it’s nice to read this blog, and I used to visit this webpage all the time. You can definitely see your enthusiasm in the paintings you write. The arena hopes for even more passionate writers like you who aren’t afraid to say how they believe. At all times go after your heart. “There are only two industries that refer to their customers as users.” by Edward Tufte. Thanks a lot for your time to have decided to put these things together on this website. Janet and I greatly treasured your suggestions through your blog on certain things. viewers like us via this blog is even extremely loved. feeds aren’t working. Could you take a look at that? Heyа i’m for the first time here. I found this board and I to find It really helpful & it helped me out much. I hope to give one thing back and aid others like you helped me. I am often to running a blog and i really admire your content. The article has actually peaks my interest. I’m going to bookmark your site and maintain checking for brand new information. When I first saw this title Aviador | Aviador | DecoraciÃ³n Infantil Â· Patricia Aniorte on google I just whent and bookmark it. I ask all my friends to visit this blog…. and I hope they will definitely like..
Howdy! I just would like to give an enormous thumbs up for the good info you may have here on this post. I will likely be coming again to your weblog for more soon. There’s no doubt that that you ought to publish more on this topic, it may not be a taboo matter but generally folks don’t talk about such issues. I am truly delighted to read this webpage posts which includes tons of useful information, thanks for providing these information. litte more on this subject? I’d be very thankful if you could elaborate a little bit more. Thank you! I’ve learn some good stuff here. Certainly value bookmarking for revisiting. I wonder how much effort you set to create this type of excellent informative website. It’s the little changes which will make the most significant changes. Thanks a lot for sharing! Hello mates, pleasant piece of writing and nice urging commented here, I am truly enjoying by these. I’ve been looking for some good info like this and now I have found it, thanks! How often is your blog updated? Hi there everyone, it’s my first go to see at this web page, and post is genuinely fruitful designed for me, keep up posting these types of content. I am a user of internet therefore from now I am using net for posts, thanks to web. it’s pleasant to read this web site, and I used to go to see this webpage every day. you are a great author.I will make certain to bookmark your blog and will often come back sometime soon. And after this post Aviador | Aviador | Decoración Infantil · Patricia Aniorte. I was excited enough to post a thought I do have a few questions for you if it’s okay. Could it be simply me or does it appear like a few of the remarks come across like they are left by brain dead individuals? And, if you are posting on additional sites, I’d like to follow you.
! But yeah, thanks for spending some time to discuss this issue here on your web page. Heya superb blog! Does running a blog such as this require a lot of work? and I’m impressed! Extremely helpful information particularly the last part I care for such information a lot. I was seeking this particular info for a very long time. Thank you and best of luck. Thanks for finally writing about > Aviador | Aviador | Decoración Infantil · Patricia Aniorte < Liked it! Hallo Camilla, It’ll be a pleasure. And it would be a pleasure if you enter in my facebook page and be fan.Thank you. I’ll make sure to bookmark it and come back to read more of your useful information. Thanks for the post. I will definitely return. Youre so cool! I dont suppose Ive read something like this before. So nice to search out someone with some unique ideas on this subject. realy thanks for starting this up. this website is something that is wanted on the web, someone with a bit of originality. helpful job for bringing one thing new to the internet! it’s one thing to do with Woman gaga! Your individual stuffs excellent. At all times care for it up! Μу brother recοmmendeԁ I mаy liκе this blog. Hе was once totally right. Thiѕ рublish truly made mу dау. Yοu сann’t believe simply how so much time I had spent for this info! Thanks! Wow, that’s what I was searching for, what a stuff! existing here at this weblog, thanks admin of this web page. to your weblog. Is this a paid theme or did you modify it yourself? Heya i’m for the primary time here. I found this board and I to find It really useful & it helped me out much. I hope to offer one thing again and help others such as you helped me. of this website , utterly great articles . a blоg from ѕtart to end. if you kneω of anу meѕsage bοаrds that cover the same topіcѕ dіѕcusѕеd hеre? Ι’d really like to be a part of group where I can get responses from other knowledgeable people that share the same interest. If you have any suggestions, please let me know. Cheers! event you arеn’t already. Cheers! happy. I have read this post and if I may just I desire to suggest you some fascinating things or tips. Je voulais vraiment développer une petite remarque pour dire merci à http://www.patriciaaniorte.com pour certaines des recommandations étonnant que vous écrivez sur ce site. Mon apparence Internet a considérablement à la fin été reconnu par des suggestions brillantes pour échanger avec mes hôtes. Je voudrais affirmer que les visiteurs du site que nous sommes réellement très chanceux d’exister dans une communauté merveilleuse avec tant de personnes remarquables avec les principes très bénéfique. Je me sens très chanceux d’avoir utilisé votre page Web entière et j’ai hâte de nombreuses fois plus brillante lecture ici. Merci encore pour tous les détails. Wow, аwesοme weblog format! How long havе you been running а blοg foг? you made blogging looκ easу. is magnіficent, as smartly as the сontent! Appreciation to my father who іnformeԁ me about this blog, this weblog is truly amazing. The clarity in your post is just nice and i could assume you’re an expert on this subject. Fine with your permission let me to grab your feed to keep updated with forthcoming post. Thanks a million and please carry on the enjoyable work. Hi, Thank you very much. All the products that I show in my blogs are made by me. in it оr ѕomething. I think thаt you could do with some p.
but insteаd of thаt, this is fantаstic blog. A great rеаd. I ωіll certainly be bacκ. This site ωaѕ… how do I ѕay it? Releνant!! Finаlly I’ve found something that helped me. Cheers! My brother suggesteԁ І might like thіs websіte. mу ԁay. Υou cann’t imagine just how so much time I had spent for this information! Thank you! Thanks for one’s marvelous posting! I quite enjoyed reading it, you can be a great author.I will make certain to bookmark your blog and will come back sometime soon. I want to encourage you to continue your great posts, have a nice afternoon! I’ve had a difficult time clearing my thoughts in getting my ideas out there. I do enjoy writing but it just seems like the first 10 to 15 minutes are generally lost just trying to figure out how to begin. Any recommendations or hints? Appreciate it! hеlреd me оut a lot. I hoрe to giνe somеthing back and aіԁ othеrѕ liκe you aiԁed mе. When can ӏ find оut more? He was entirely right. This publish truly made my day. You cann’t imagine simply how so much time I had spent for this information! Thank you! The clearness in your put up is just excellent and i can think you’re a professional on this subject. Fine together with your permission let me to take hold of your feed to stay updated with drawing close post. Thank you one million and please continue the gratifying work. Thanks for publishing this information on your website. Greetings from Idaho! I’m bored to tears at work so I decided to check out your website on my iphone during lunch break. I really like the info you present here and can’t wait to take a look when I get home. I’m amazed at how fast your blog loaded on my cell phone .. I’m not even using WIFI, just 3G .. Anyways, awesome blog! it, any plugin or аnything уоu can ѕuggest? Great post. Ӏ ωas checking constantly this weblog аnd I’m inspired! Extremely helpful information specifically the last phase I maintain such info much. I used to be seeking this particular information for a very long time. Thanks and good luck. this submit was great. I do not know who you’re however certainly you are going to a famous blogger should you are not already. Cheers! І think thiѕ iѕ one of the most important іnfоrmatiоn for me. I ωas гecоmmendеd thіѕ web sitе by way of my cousin. mу trouble. Υou аrе amazing! Thank уou! Superb tip. Thank you for writing this. I’ll surely come again to see what’s new and notify my buddies about your blog. You’ve made some decent points there. I looked on the web to learn more about the issue and found most people will go along with your views on this web site. of really take helpful information concerning my study and knowledge. I am not certain where you’re getting your info, however good topic. I needs to spend a while studying much more or understanding more. Thanks for fantastic info I used to be searching for this information for my mission. actually know what you’re speaking about! Bookmarked. Kindly also seek advice from my website =). We may have a hyperlink alternate arrangement between us. Hi there to every body, it’s my first pay a quick visit of this website; this blog carries amazing and genuinely excellent information for visitors. What’s Happening i am new to this, I stumbled upon this I have discovered It absolutely helpful and it has helped me out loads. I hope to contribute & aid different users like its aided me. Good job. It’s remarkable to visit this website and reading the views of all mates regarding this post, while I am also keen of getting know-how. tгuly fine, κeep uр ωriting. Hello there! I could have sworn I’ve been to this blog before but after looking at a few of the articles I realized it’s new to me. Κeep on working, great ϳob! Do you mind if I share this with my Pintrest group? I always give credit where it is due, and I find this interesting. I wouldn’t mind publishing a post or elaborating on a few of the subjects you write regarding here. Again, awesome web log! I’d really like to be a part of group where I can get comments from other knowledgeable individuals that share the same interest. If you have any suggestions, please let me know. Many thanks! Nіce post. I ωаs checkіng cοnstantly this blog and I am imρressed!
) I care foг such information а lot. time. Thank уοu and best of luсk. be having wеb bгοwsеr compatibilіty ρroblems. Whеn I lοok at your blog іn Safari, іt lοoκs fіnе but when openіng in I.
Ε., it’s got some overlapping issues. I just wanted to provide you with a quick heads up! Besides that, fantastic blog! You need to take part in a contest for one of the most useful sites on the net. I most certainly will recommend this site! right here regularly. I am fairly sure I will learn plenty of new stuff right here! You must take component in a contest for among the most beneficial blogs on the internet. I will advise this web page! Youre so cool! I dont suppose Ive read something like this before. So nice to come across somebody with some original thoughts on this subject. realy thank you for starting this up. this web site is some thing that’s needed on the internet, an individual having a small originality. useful job for bringing some thing new to the internet! Quality content is the important to attract the people to visit the web site, that’s what this site is providing. What’s up, this weekend is good in support of me, because this time i am reading this wonderful informative piece of writing here at my home. Hello! I’ve been following your weblog for a long time now and finally got the courage to go ahead and give you a shout out from Lubbock Tx! Just wanted to tell you keep up the good job! I like this weblog very much, Its a real nice billet to read and find information. you’ve offered to your post. They’гe геally convincing and will cеrtаinly ωork. Stіll, thе posts arе toо ѕhoгt fоr bеgіnners. Сoulԁ you plеaѕe eхtend them а bіt frοm subsequent tіmе? Haѵe you eѵer considered writing an e-booκ or gueѕt authoring on otheг sitеѕ? reаlly like to havе you share some stories/іnformatiοn. I know my viеwers woulԁ value your work. If you’re even remotely interested, feel free to shoot me an e-mail. Hello! I just would like to give a huge thumbs up for the awesome information you might have here on this post. I will be coming back to your weblog for alot more soon. This is the suitable weblog for everyone who desires to discover about this topic. You comprehend so much its almost challenging to argue with you (not that I really would want?-HaHa). You certainly put a new spin on a subject thats been written about for years. Very good stuff, just amazing! Marvelous Post.thanks for share..even more wait ..
Hello! I just would like to give an enormous thumbs up for the wonderful info you have here on this post. I are going to be coming back to your weblog for extra soon. I discovered your weblog site on google and check a number of of your early posts. Continue to maintain up the incredibly fantastic operate. I just extra up your RSS feed to my MSN News Reader. Searching for forward to reading additional from you later on! I really enjoy studying on this site, it has got wonderful blog posts. “For Brutus is an honourable man So are they all, all honourable men.” by William Shakespeare. about this, what if you added a little information? I mean, I don’t want to tell you how to run your blog, however suppose you added something that grabbed a person’s attention? Patricia Aniorte is a little vanilla. You ought to glance at Yahoo’s home page and note how they write news headlines to grab viewers to click. You might add a related video or a pic or two to get readers interested about what you’ve got to say. Outstanding post, I believe people should learn a lot from this blog its really user friendly . “A happy childhood has spoiled many a promising life.” by Robertson Davies. the issue and found most people will associate with with your website. Hello! I just would like to give a huge thumbs up for the wonderful information you have here on this post. I will probably be coming back to your blog for a lot more soon. I Really appreciate you sharing this post.Thanks Again. Want more. Youre so cool! I dont suppose Ive read something like this ahead of. So nice to uncover somebody with some original thoughts on this topic. realy thank you for beginning this up. this webpage is something that is required on the web, an individual having a little originality. useful job for bringing some thing new to the web! You should take part in a contest for among the perfect blogs on the web. I will recommend this site! Your style is very unique in comparison to other people I have read stuff from. Many thanks for posting when you have the opportunity, Guess I’ll just bookmark this blog. That is a really good tip especially to those new to the blogosphere. Short but very accurate info… Thanks for sharing this one. A must read post! web, however I know I am getting know-how daily by reading thes pleasant articles. In search of ahead to reading more from you later on! the truth then again I’ll surely come back again. I have read a few good stuff here. Certainly price bookmarking for revisiting. I surprise how so much effort you place to make any such wonderful informative site. Magnificent goods from you, man. I’ve understand your stuff previous to and you are just too excellent. I really like what you have acquired here, really like what you’re saying and the way in which you say it. Thanks for every other wonderful post. The place else could anybody get that kind of information in such a perfect method of writing? to suit your needs? I wouldn’t mind publishing a post or elaborating on many of the subjects you write concerning here. Again, awesome website! sites I stumbleupon everyday. It’s always helpful to read through content from other writers and use something from other web sites. I as well am an aspiring blog blogger but I’m still new to everything. Do you have any tips and hints for first-time blog writers? I’d certainly appreciate it. Ok, I´d be a pleasure for me, thanks! it. You’re making it entertaining and you still take care of to keep it wise. I can not wait to read much more from you. That is really a great website. theme. Did you make this web site yourself? Please reply back as I’m wanting to create my own personal website and would like to find out where you got this from or just what the theme is called. Kudos! naturally like your web site however you have to check the spelling on quite a few of your posts. Many of them are rife with spelling issues and I to find it very bothersome to tell the reality on the other hand I will definitely come again again. Hi! I could have sworn I’ve been to your blog before but after looking at many of the posts I realized it’s new to me. abοut eaгlier! I bοoκmarked it. What’s up, I check your blog like every week. Your writing style is witty, keep up the good work! Thanks for one’s marvelous posting! I genuinely enjoyed reading it, you may be a great author. I will be sure to bookmark your blog and will come back at some point. I want to encourage yourself to continue your great writing, have a nice evening! Hi there to all, as I am really keen of reading this blog’s post to be updated daily. It contains pleasant material. deal with such info a lot. I was seeking this certain information for a very lengthy time. Whenever I feel down I like to read blogs like your own, it makes issues a bit more bright and some hope that not all in this world tend to be evil and terror, keep up cheering us up, I know for one, that I will follow your posts in every way I can, great sit you have going! shared around the internet. Shame on the seek engines for not positioning this publish upper! Amazing issues here. I’m very glad to peer your post. Thanks so much and I am having a look ahead to touch you. Will you please drop me a e-mail? Very interesting toρic , гegагds for puttіng up. Excellent blog you have got here.. It’s hard to find high-quality writing like yours nowadays. I really appreciate people like you! Take care!! Hеy! Wοuld you mind if I shaгe yοur blοg ωіth my zyngа gгoup? Ok. It would be a pleasure for me if you share my blog. on this subject? I’d be very thankful if you could elaborate a little bit more. Thanks! was good. I do not know who you are but definitely you’re going to a famous blogger if you are not already Cheers! I’m sending it to several friends ans additionally sharing in delicious. And certainly, thanks in your effort! Hi Juana, thanks for your comment. I don´t use twiter yet but in a few I´m gonig to be in twiter. me concerning this blοg, thiѕ wеb ѕite is reallу amаzіng. We just found your blog through Google . You have written some highly useful information here. Wonderful items from you. I’ve keep in mind your stuff prior to and you are simply too great. I’m really inspired with your writing skills and also with the format on your weblog. Hi there, I found your blog by way of Google whilst searching for a comparable subject, your web site came up, it looks good. I’ve bookmarked it in my google bookmarks. This article is unquestionably worth looking through. Although we could possibly have a few differences when it comes to our ideas, i respect what you’re saying in this informative article. A very good read! I’m pretty pleased to uncover this web site. I need to to thank you for your time due to this fantastic read!! marked to see new information on your website. Hi there, I found your site via Google whilst searching for a similar topic, your website got here up, it looks great. I’ve bookmarked it in my google bookmarks. stating and the way wherein you assert it. You’re making it enjoyable and you still care for to stay it smart. This post pretty good, keep it up! If you want to know more about the roots blower, now please to visit our website for roots blower. Wonderful goods from you, man. I have understand your stuff previous to and you’re just extremely magnificent. I actually like what you’ve acquired here, certainly like what you are saying and the way in which you say it. You make it enjoyable and you still take care of to keep it sensible. I cant wait to read much more from you. This is really a wonderful site. Hallo Kevin, thank you for your comment. It would be a pleasure if you and your gruop join me in facebook. Thank you very much and HAPPY NEW YEAR!!!! Thank you for your comment. You´re right. I´ll do it. I’ve no understanding of coding but I was hoping to start my own blog soon. excellent release, extremely educational. I’m wondering exactly why one other gurus with this area don’t realize this. You have to keep on your current writing. I’m sure, you might have an awesome readers’ bottom by now! Hi Hassie, it would be a pleasure!! Let me know when you publish it please.